Now that the Trump administration has derailed the Iran nuclear deal, the old issue of regime change in Iran is back again. National Security Advisor John Bolton is obviously the chief regime-change advocate in the administration, and there is every reason to believe he has begun to push that policy with Donald Trump in his first month in the White House. Bolton was part of the powerful neoconservative faction of national security officials in the George W Bush administration that had a plan for supporting regime change in Iran, not much different from the one Bolton is reportedly pushing now. But it was a crackbrained scheme that involved the Mujahideen-e-Khalq (MEK) exiled terrorist organisation that never had Bush’s support. “Iran’s leaders” are “going to want to make a new and lasting deal, one that benefits all of Iran and the Iranian people”. Bolton has not only appeared at MEK rallies in Paris, along with other former US officials on the take from the well-endowed paramilitary organisation. 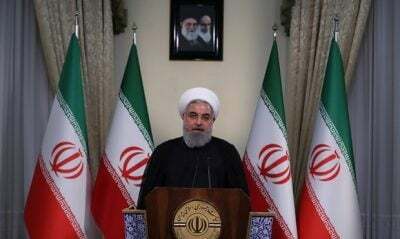 In July 2017, he declared that the Trump administration should adopt the goal of regime change in Iran, calling MEK a “viable” alternative to the regime. And his final line, delivered with his voice rising dramatically, noted that “before 2019, we here will celebrate in Tehran”. It appears that Bolton was still pushing the idea within the administration as of last week. 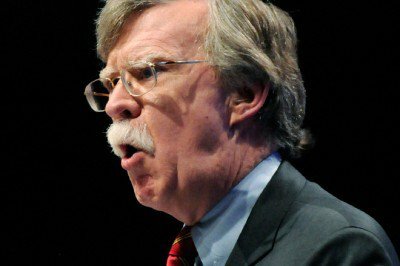 The Washington Free Beacon reported on 10 May that a three-page paper outlining a regime-change strategy from a small far-right organisation called the Security Studies Group, with which Bolton is said to have close ties, was circulated among NSC officials. The quotes from the paper in the story make it clear that the strategy is based largely on seeking to exploit ethnic and religious conflicts in Iran. The paper reportedly makes the point that ethnic minorities – such as Kurds, Azeris, Ahwazi Arabs and Baloch – represent one-third of Iran’s population, and argues that the Iranian regime’s “oppression of its ethnic and religious minorities has created the conditions for an effective campaign to splinter the Iranian state into component parts”. Those minorities have all had organisations that have carried out violent actions, including bombings and assassinations against Iranian officials, over the past decade, and such a strategy would presumably involve supporting a step-up in such activities – in other words, US support for terrorist activities against Iranian government targets. Despite the neocon fixation with supporting MEK, both the CIA and the Israelis have long regarded the idea that it could be an instrument for regime change in Iran as ridiculous. After the organisation helped Saddam Hussein’s regime suppress Shia and Kurdish uprisings, it lost any semblance of legitimacy inside Iran. After it relocated to Iraq, moreover, it was transformed into an authoritarian cult. The former Israeli ambassador to Iran, Uri Lubrani, who was given a free hand to organise a programme for destabilising Iran, recognised long ago, as he told two Israeli journalists, that MEK has no capacity to do anything inside the country. It was Lubrani who first advanced the argument that about a third of the total Iranian population were ethnic minorities, and that promoting their anti-Tehran activities could help to destabilise the government. Those groups have carried out terrorist bombings and other armed actions in various parts of Iran over the years, and it is well documented that Israel was supporting and advising the Baloch extremist organisation Jundallah on such operations. But the Israelis have used MEK mainly to put out disinformation on Iran’s nuclear programme.